Today, the German partners finalized the final report of the SMC-Excel project. You can find the report here: Final German SMC-Excel Report. Impressions from the VESTEL Electronics exhibition hall @ IFA 2017. For a short summary in German about our presentation at IFA by our partner-company e-hoch-3, please click here. On Saturday, VESTEL Electronics will present the final version of the web-based demonstrator at IFA 2017 in Berlin (02.09.2017). Visitors can test the configurator at a large touch screen and experience the customization process while getting informed about the environmental impact of their choices. You find the VESTEL exhibition stand in the Hall 8.2. An environmental analysis of the proposed SMC introduction in the consumer electronics industry in comparison to the traditional mass production business model. A market potential analysis to assess customers’ perception and acceptance of SMC offerings. A set of policy recommendations and ideas for fostering the development of SMC business models. Two studies, which result from this workpackage have been submitted and accepted for presentation at the 9th World Mass Customization & Personalization Conference (MCPC 2017) taking place at Aachen on Nov 20-21 2017 and will published by Springer in the MCPC 2017 proceedings afterwards. A third evaluation study, an Outcome Driven Innovation study on consumer needs in the different life cycles of TVs has been accepted by the European Roundtable of Sustainable Consumption & Production (ERSCP) taking place in Greece on Oct 01-05 2017. The SMC Excel team is currently meeting at Funchal for a project meeting for finalizing the work of the environmental evaluation and the derivation of policy recomendations of WP4. Moreover, the project team offers two workshops at the ICE Conference. The first workshop co-chaired by Maike Hora (e-hoch-3) and Sultan Kaygin Sel (VESTEL Electronics) deals with user interface design for sustainability. The second workshop focuses on circular economy business models and is co-chaired by Luca Canetta (SUPSI) and Stephan Hankammer (RWTH Aachen University). Both workshops take place Wednesday 28.06.2017. Also on Wednesday one of the academic studies resulting from the SMC Excel project will be presented in the course of a special session of the conference. The article “A Sustainability Based Optimization Model for Starting Solutions in Toolkits for Mass Customization” will be presented by Stephan Hankammer. In November 2017, the next edition of the MCPC conference series will take place in Aachen, Germany. The SMC Excel team is currently preparing their submission to present the results of the ECO INNOVERA project that started in April 2014 and that will finish shortly before the conference in October 2017. There will be one key conference track dealing with “Mass Customization & Sustainability”. We would like to encourage other scholars that work in the field of sustainable mass customization, circular economy business models, sustainable PSS and localized and decentralized production to submit their research to this track. We look forward to discuss with you the potentials and the downsides of using MCP as a vehicle for sustainability. 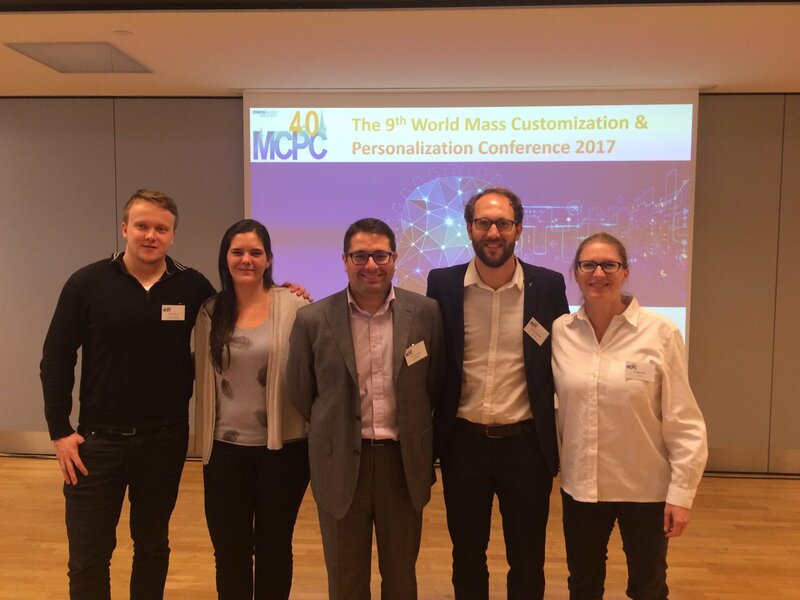 The 9th World Mass Customization & Personalization Conference takes place in Aachen, Germany, November 20-21 2017! It will feature four large tracks on Mass Customization & Sustainability, Smart Products, Digital Manufacturing, and MCP success factors! Here, you find the call for paper! The SMC Excel consortium developed a first version of a web-based configurator for TVs. To test and improve the configurator, we would like to encourage interested readers of our website to participate in a 15-minutes survey: https://www.unipark.de/uc/rwth/tim/tv/. Thank you very much for participating! The project consortium successfully published an article on the Design of Business Models for Sustainable Mass Customization in the International Journal of Industrial Engineering and Management (IJIEM). The paper is available at or at . SMC Excel member Stephan Hankammer will present results of the SMC Excel Project and the current state of a consumer research study on Sustainable Mass Customization at RWTH Aachen University’s “Innovation Research Seminar” on 11 January 2017, 2.00 to 3.30 pm, in the TIM Social Area, Kackertstraße 7. The title of the presentation is “Nudging Customers Towards More Sustainable Choices”. You are warmly welcome! The 5th Consortium Project Meeting in Darmstadt (Germany) took place on the 2nd and 3rd of November, 2016. The partners of the SMC Excel project (VESTEL, RWTH Aachen, SUPSI, and e-hoch-3) met to discuss the current state of the SMC Excel project and further steps for future project planning. Each partner gave one or more presentations to focus on the main topics, including the WP3 overall activities such as business models for recycling scenarios, the development of the solution space regarding components and their environmental evaluation, and the configurator user interface design. For future planning the team discussed dissemination strategies and deadlines for 2017, as well as the WP4 with focus on Policy recommendations. Finally, the possible application of SMC on future projects was discussed leading to the closure of the meetings. World’s leading consumer electronics show took place in Berlin, Germany, between September 02 and 07. Sultan Kaygın Sel from SMC-Excel partner Vestel attended IFA this year for taking insights of latest trends in consumer electronics. Vestel (similar to previous years) was one of the biggest exhibitors having 3000 m2 exhibition area used for presenting a wide variety of its product range and new concepts. • Experience was the most important concept for this year at IFA. Most of the companies have used their fairground area more for experience areas like trial of VR glasses. • A great number of companies have presented their VR (virtual reality) products. Many applications of VR such as gaming in entertainment industry are emerging. • Smart home concepts were introduced by all leading consumer electronics companies. Their presentations were more comprehensive and satisfying when compared to previous years. • OLED and Quantum dot displays were competing for display technologies. • Screen sizes are getting bigger and bigger. There were 98” and over sizes presented. • Product presentations were focused on the visual and technical performance of the products. Unlike the previous fairs, the physical specifications of TVs such as thickness or curvature were not highlighted. Also 3D TV concept disappeared. • In contrast to previous fairs with a focus on UHD, it is observed that 4K displays have become common. • Various applications of Digital Signage products have been presented by almost every company at the fair. In addition to existing product solutions, mirror display and transparent display models have been presented. Scientific American posted an interesting story on customizable (and sustainable) smartphones this 1st of July. You find the story here. For the development of this story, the SMC Excel project was happy to provide insights for the assessment of Google’s Project Ara. We are very happy to announce that the (full consortium) article “User-Interface Design for Individualization Services to Enhance Sustainable Consumption and Production” has been accepted for publication in the Open-Access Journal Procedia CIRP and selected for presentation at this year’s IPSS CIRP Conference (Product-Service Systems across Life Cycle) taking place in Bergamo (Italy) in June 2016. The paper assesses the integration of sustainability in the individualization service offered through user-interfaces, such as in particular configurators, both theoretically and empirically. It provides insights from reviewing more than 900 web-based configurators within 16 different industries. The analysis reveals that only about five percent of all user-interfaces address sustainability issues in their individualization services. From October 20th to 22nd the 2015th World Conference on Mass Customization, Personalization and Co-Creation took place in Montreal, Canada. Researchers from all over the world came together to discuss recent academic research and issues related to the implementation of MC in practice. SMC-Excel project leader Frank Piller held a keynote on complexity as an innovation driver. In his speech he especially shed light on the question how businesses can profit from MC. In September 2015 the project consortium met in Manisa (Turkey) for its fourth project meeting hosted by VESTEL Electronics. In this project meeting we mapped the current business model(s) used by VESTEL for their domestic market on the one hand and their international market on the other hand. Furthermore we created a box of bricks of business model pattern elements related to MC and one related to Sustainability. These boxes of bricks will be used in a next step, in which 3-6 elements will be combined to generic SMC business model patterns. From the 18th-21st of May 2015 the SMC-Excel Project participates at the 7th IPS² Spring School on Sustainable Product-Service Systems Design in Grenoble and Saint Etienne (France). Here, around 25 researchers from several European countries come together to discuss possibilities to design Sustainable Product-Service-Systems. For the SMC-Excel project this program is especially useful in order to understand how to integrate services into a mass customization product offering and how to assess the sustainability of use phase oriented business models. In the beginning of May 2015 the project consortium met in Lugano (Switzerland) for its third project meeting hosted by the Department of Innovative Technologies, SUPSI. At the center of attention was the theoretical environmental analysis of possible customization options as a first step for the creation of scenarios for sustainability oriented business models based on mass customization. The project team further shed light on the role of recycling in a customized product offering and visited the industrial recycling plant of GAVIA. (1) the transformations needed to implement and boost PSS systems at company and territory levels, covering multiple dimensions such as business model transformation, collaborative behaviour enhanacement, cultural changes, consumption model evolution etc. (2) the needs for and challenges underpinning the integration of sustainability and business innovation, putting forth requirements for new sustainability assessment methods to address the complexity and diversity of PSS. The final deadline for full paper submission is the 31st of January 2015. To learn more about the scope and topic of this special session, take a look at the official IPSS website. We are happy to announce that the article “A Contribution toward a Research Agenda: Identifying Impact Factors of Mass Customization on Environmental Sustainability” has been published in the International Journal of Industrial Engineering and Management (IJIEM) in December 2014. The research has been conducted in collaboration between Politecnico di Milano, RWTH Aachen University and Aalborg University. You can find the article here. At the Final Conference, ECO-INNOVERA has presented the findings of its systemic approach in Copenhagen to more than 100 key players from 24 countries, including not only policy makers and scientists but also SME-representatives and partner networks in research and development in eco-innovation. Their findings were published in a Final Report that can be accessed by clicking on the link.